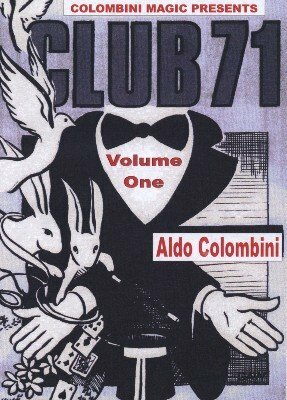 The English magazine Club 71 ran from 1970 to 2007 and was produced by Geoff Maltby the owner of Repro Magic. For most of the time Walt Lees was the editor. Contributors include: Max Maven, Peter Duffie, Patrick Page, Al Smith, Angelo Carbone, Ian Rowland, Werner Miller, Peter Kane, Paul Hallas, Stephen Tucker, Ali Bongo and many more. The subjects discussed span everything from mentalism and cards, to magic for children and close-up. AROUND THE WORLD (Peter Underwood): A great mental effect. Two cards are selected by a cut of the deck done by a spectator. The two values added and an Atlas opened at that page to select a country. You have predicted that country. RISEN AGAIN (Denis Lipman): A card is replaced and the entire deck is placed inside the cardbox. The box is covered with a handkerchief and the selected card rises from the cardbox under the handkerchief. CARD IN MIND (John Brennan): A stunning and unique revelation of a freely selected card. THE NAME DROPPER (Denis Lipman): A selected card is revealed by using the spectator's name. NOT JUST ANOTHER CARD TRICK - AN ESP ROUTINE (Joe Riding): A strong routine on the 'Follow The Leader' theme using eight ESP cards. DIMINISHING SPONGE BALL (Michael Symes): A large sponge ball is shrunk to a smaller ball and this, as well, is magically changed into a smaller ball and then the small ball vanishes completely. COINCIDENCE CARD (Al Smith): A great routine with two decks of cards, easy and totally impromptu. You place a deck in its case. A spectator selects a card from the other deck and its mate appears reversed in the cased deck. POWERS OF PERCEPTION (Louis Phillips): You show the Six of Spades face up on the deck. You slide a face-down card on top and the face-up card changes into the Six of Clubs and the card in hand is the Six of Spades. A very simple transposition, but a puzzling effect. AMBITIOUS CARD SUPREME (John C. Mournier): A card is chosen and placed somewhere near the bottom of the deck. The card rises to the top. The card is inserted near the middle of the deck and rises to the top. It is then placed second from the top and it appears on top. This can be repeated two or three times. ORIGINAL COLOR CHANGING DECK (Robert Kirkham): One card taken from a red-backed deck becomes blue. The rest of the deck changes to match.